Description: Clip art photograph of U.S. 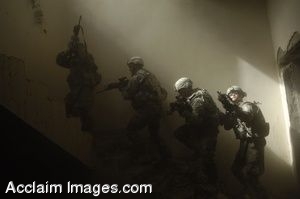 Soldiers with Echo Company, 5th Cavalry Regiment, 172nd Infantry Brigade prepare to clear a staircase during a combined training exercise with Iraqi soldiers near Bahbahani, Iraq. (U.S. Navy photo by Petty Officer 2nd Class Kim Smith). Clipart photograph by Department of Defense Public Domain.